farm markets open from May until September or October. Sara Hardy Farmers Market downtown Traverse City between Grand Traverse Bay and the Boardman River. Open Saturdays from 7:30am - 12pm, and Wednesdays 7:30am - 12pm from early May to late October. The Village Farmers Market between Cottageview and Red Drive at Grand Traverse Commons. Outdoor Market on The Piazza Mondays from 3pm - 7pm. In the colder months, Indoor Market in The Mercato corridor Saturdays 10am - 2pm. 9 Bean Rows, 5441 N. Overlook Rd., Northport (231) 271-1175. Altonon Orchard, 10748 M-72 E, Williamsburg, (231) 267-9333. Amon Orchards & Farm Market, 410 W. Thirteenth St., Traverse City, (231) 946-3662. Brown Brothers Farm LLC, 5313 N. Swede Rd, Omena, (231) 386-5829. Cedar Sol Hydro Farm, 9452 S. Cedar Rd., Cedar; (231) 883-8080. Chaney Farm Market, Williamsburg, (231) 267-9956. Cherry Bend Farm, 9606 E. Cherry Bend Rd, Traverse City, (231) 932-7571. Clearwater Farm Market, 6855 Rapid City Rd NW, Rapid City, (231) 331-6242. Covered Wagon Farm Market, 8996 E. Duck Lake Rd., Suttons Bay, (231) 271-6658. Elzer Farm, 15208 Peninsula Dr, Traverse City, (231) 223-4369. Farm 651, 9595 S. Cedar Rd., Cedar, (231) 944-5283. Farmer White's, 11373 U.S. 31, Williamsburg, (231) 632-1500. Frosty Acres, 6875 Bates Rd, Williamsburg, (231) 267-5411. Gallagher's Centennial Farm, 5904 N. Long Lake Rd., Traverse City, (231) 421-5199. Gallagher's Farm Market and Bakery, 7237 E. Traverse Hwy., Traverse City (231) 947-1689. Groleau Farm Market, 2100 Hammond Rd E, Traverse City, (231) 929-9654. Hooper's Farm Gardens, 2399 Kroupa Rd, Traverse City, (231) 649-2826. Hoxsie's Farm Market, 6620 M-72 E, Williamsburg, (231) 267-9087. Leelanau Produce, 9606 E. Cherry Bend Rd., Traverse City, (231) 932-7571. Light of Day Organic Farm & Tea Shop, 3502 E. Traverse Hwy., Traverse City, (231) 228-7234. Milk Maiden, 202 S. Union St., Traverse City, (231) 228-7743. Traverse Bay Farms, 7053 S M-88 Hwy., Bellaire, (231) 533-8788. Youker Farm Market, 4977 S M-37, Grawn, (231) 943-4003. 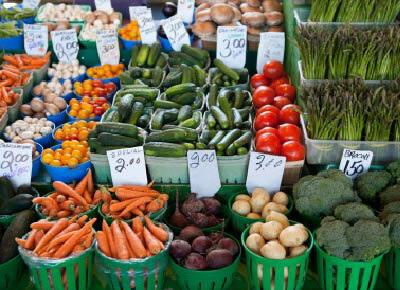 Also read about Farm Markets in Northern Michigan and Farm Markets in West Michigan.